Ed Anonas is a veteran in the hospitality industry with over 25 years of experience and has held positions with some of the largest and most progressive hotel companies in the U.S.
Ed recently worked for The Langham in Pasadena, formerly The Ritz Carlton Hotel & Spa where he re-organized the finance department to improve employee morale and workflow. Ed also established, coordinated and administered financial systems, capital plan and reporting guideline. From 2002 to 2009, Ed served as the Director of Finance and Operations for the Hotel Bel-Air, a world-renowned luxury Hotel. He worked closely with the hotel owner, Prince Jefri Bolkiah of Brunei. Ed's operational duties included managing the day-to-day operations of the property, assisting management in establishing cost controls, implementing labor productivity standards as well as monthly profit and loss reports to ownership. Ed was also involved in assisting management lobby for the approval of the additional 15 suites and 15,000 square foot spa. His tenure at Hotel Bel-Air contributed significantly to the hotels profitability. From 1997 to 2002, Ed worked for Starwood Hotels & Resorts and participated in the launch of the new W Hotels. Ed was a member of the original team that developed comprehensive financial controls and procedures for the new brand, which led to significant profit levels and financial accountability. He also participated in launching the Six Sigma Program and received certification through various intensive training. In 1995, Ed joined the trendsetting Ian Schrager Hotel Group where he participated in the renovation and transformation of the Le Mondrian Hotel to be the first Hip/Trendy hotel in Los Angeles with the addition of Rande Gerber's famous Sky Bar. In 1991, Ed worked for a Japanese owned company under Shinko Management Inc. and served as Corporate Controller where he managed the finance and operations of various entities including boutique hotels and luxury apartment buildings in the US and Japan. Ed was born in the Philippines; graduated with a degree in Bachelor of Science in Commerce, major in Accounting. He is married to Regina and they have seven wonderful children, two daughter-in laws and three grandchildren. 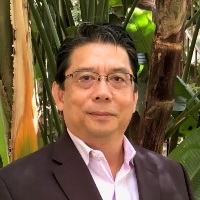 Ed is an active board member of the Hospitality Finance and Technology Professionals in Los Angeles where he has served as Treasurer, Vice President and President.